High purity preparative purification of chiral compounds by recycling preparation HPLC system | YMC CO., LTD. The multifunctional preparative HPLC system, LC-Forte/R is equipped with a recycling function as a standard feature. This enables high purity purification of the compounds which are difficult to separate in a single step even without changing columns and mobile phase. 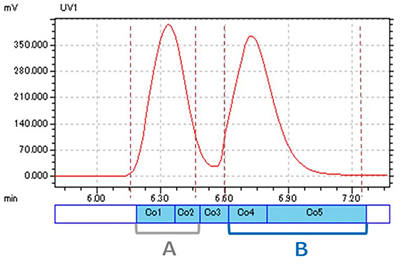 In addition, CHIRAL ART, columns/packing materials with polysaccharide derivatives as their chiral selectors, have a range of packed columns with inner diameters up to 30 mm and are applicable to separations from analytical to preparative scale. 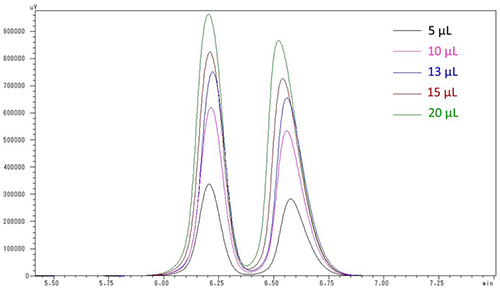 Presented below is an example of high purity preparative purification of flurbiprofen using LC-Forte/R and CHIRAL ART column. Analytical study is performed for following points. From the result of the analytical column separation (injection volume 13 µL), the next step is to scale up to a preparative column. With the preparative column of 30 mm inner diameter, the same resolution obtained for the analytical column can be achieved by injecting 585 µL (loading: 11.7 mg); this is 45 times of the cross-sectional area ratio for 4.6 and 30 mm inner diameter column. To achieve higher purification thoroughput, loading needs to be increased. Since it is difficult to keep current resolution and recovery with higher loading, recycling preparation is considered as a next step. Recycling separation is a method that achieves the same effect as a separation using a longer column by repeated separation of the compounds through circulation of the mobile phase. LC-Forte/R provides a high efficiency preparative separation as a result of its new and unique flow path to reduce the extra-column diffusion. 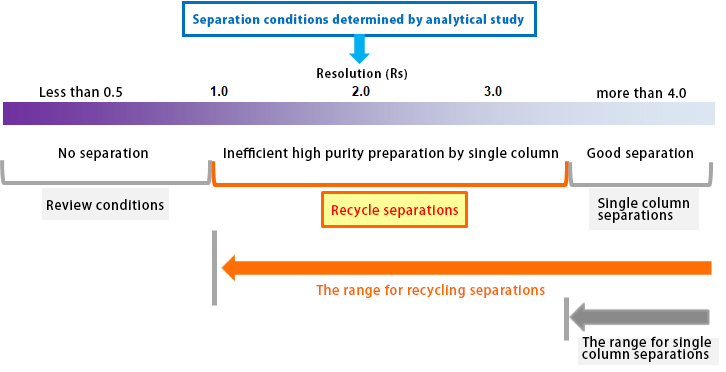 Purification can be performed under higher loading with recycling method than with single column method. 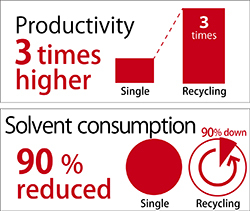 In addition, consumption of solvents can be significantly reduced due to circulation of mobile phase during recycling preparation. Column : 250 X 30 mmI.D. 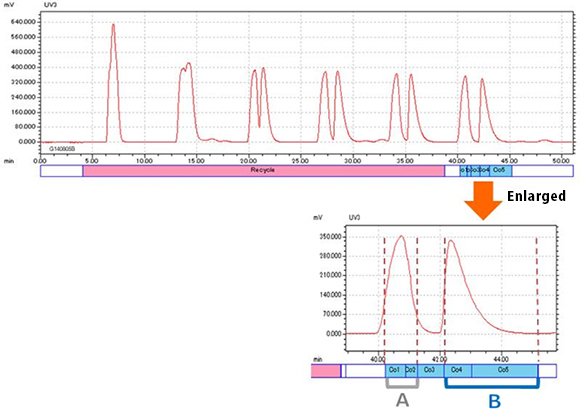 *Productivity of a single column separation is estimated based on the stacking injection of the sample every 2.5 minutes. By the single column preparation, it is difficult to achieve high purity purification without having sufficient resolution. On the other hand, by the recyclying preparation, high purity purification is possible even with insufficient resolution because repeated flushing improves the resolusion even when result of single column preparation is insufficient. The guideline for resolution for high efficiency preparation should be 4 and above for single column preparation and 1 and above for recycling preparation from the value of the analytical test. Recycling preparation is more effective for the compounds that separation is difficult such as analogs and optical isomers.